Two preventive measures that Dr. Sapienza often recommends to ward off tooth decay are fluoride treatments and dental sealants. Although these are commonly administered to children whose teeth are developing, they can also provide an added layer of protection for adults, as well. Fluoride is a mineral that is naturally found in many foods and water. In fact, most public utilities now add fluoride to water in an effort to help citizens maintain dental health. Fluoride works two ways. First, fluoride strengthens the enamel layer of teeth, your first line of defense against plaque bacteria and sugars that cause tooth decay. Secondly, fluoride re-mineralizes spots on your teeth that have been weakened by acid, thereby helping to sidetrack the development of cavities. 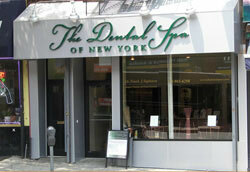 At The Dental Spa of New York, we apply fluoride to teeth as necessary during regularly scheduled dental checkups. Although fluoride is added to tap water, as well as to toothpaste and mouth rinses, the concentration we can use in the office is greater. And because of the popularity of bottled water, many people are not getting enough fluoride naturally. Like fluoride treatments, dental sealants help in the battle against tooth decay. Sealants are a clear or white plastic liquid that is “painted” on molars. Once hardened, sealants become a physical barrier between bacteria-causing decay and your teeth. Sealants are particularly helpful in children whose deeply pitted and grooved molars may make brushing adequately difficult; food particles and the resulting bacteria can hide and cause cavities. Dental sealants enhance the benefits of fluoride; they do not replace fluoride treatments. Together, these two preventive measures can help you maintain a healthy smile. Dr. Sapienza and the staff at The Dental Spa of New York would be delighted to take care of your and your family’s dental needs. The dentist Park Slope trusts conveniently serves patients from the surrounding communities of Brooklyn Heights, Cobble Hill, Prospect Heights and Carroll Gardens and other areas of Brooklyn and Queens.